Article: How do you know your rewards strategy is working? How do you know your rewards strategy is working? A panel of rewards experts explores the answer to the question "How do you know your rewards strategy is working"
People Matters Total Rewards Conclave 2017 kick-started with a panel discussion which answered the intriguing question – “How do you know your rewards strategy work?” The panelists, Amitabh Johri from Quatrro, Isaac Koshy from Emirates NBD, Mahalakshmi R from Mondelez and Nishit Shah from Infosys BPO, moderated by Ester Martinez, CEO and Editor-in-Chief, People Matters, were joined by an engaged audience of 600 people in answering this challenging question. This article explores some key questions that emerged from the discussion and the diverse opinions of the diverse panel. Q. How do you create a rewards strategy? A. The rewards strategy stems from the business strategy. Business needs are different at different stages – sometimes the business objective is to optimize costs, sometimes it is to increase marketshare. So the rewards strategy needs to be aligned to the same. The business sets its strategic objectives, which is made into an operational plan. That tactical plan translates into KRAs and KPIs which are then used to define the rewards strategy. A clarity on the role of rewards professionals makes the process easier. 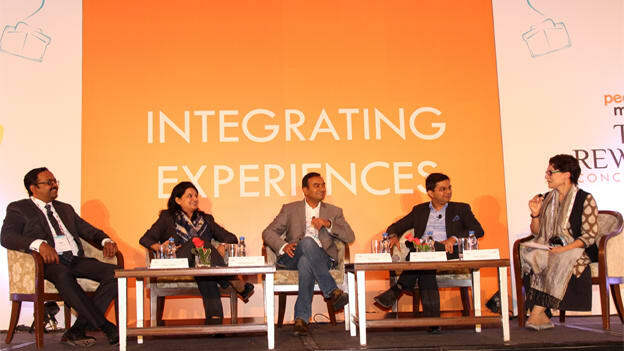 Mondelez’s Mahalakshmi says, “Rewards professionals are facilitators and not drivers. So instead of engaging in a tug-of-war, Rewards professionals need to look at creating a fluid process” The role of rewards professionals boils down to making the right choices, play within the boundaries as decided mutually with the board and use the allocated budget in the most optimal manner. Rewards professionals have to do the best with what they have. Q. What are the lead indicators to know that your rewards strategy is working? How can they be made more “real time”? A. All strategies have to be measured keeping three stakeholders in mind – External stakeholders, internal stakeholders, and employees. The metrics also vary from business to business and rely on a combination of factors including industry dynamics and market trends. Infosys BPO’s Nishit Shah, for instance, highlighted that they use the employee motivation levels and attrition numbers (among other metrics) to measure the efficacy of their rewards programs. The course of action after identifying whether the strategy isn’t working real-time holds even more importance. Quatrro’s Amitabh suggests that one should take periodic (most probably quarterly) dipsticks to check a rewards strategy’s efficacy. And you recalibrate and create a plan if needed based on the new market strategy. Q. How do you know the rewards strategy is working for employees? A. Many organizations have migrated to a pay for performance model and the variable pays are anyway linked to performance. It is transparency in one’s rewards strategy and strictly following the performance metrics that ensure objectivity and can keep employees satisfied. A lot of permutations and combinations work in getting the rewards strategy right, but knowing whether this is working or not, always assists in recalibrating till one finally does.